South Boston residents are disgusted after someone vandalized the neighborhood's World War II memorial, appearing to have splashed or poured some type of oil over the granite stones. A day after South Boston celebrated St. Patrick's Day, the neighborhood's World War II Memorial was vandalized. Massachusetts State Police said they received a call reporting the vandalism around 11:30 a.m. Monday. Troopers responded and discovered a substance - believed to be a type of oil - splashed or poured onto the granite memorial stones. “I think it’s a disgrace,” said South Boston resident Robert Ryan. “It’s appalling. It’s our neighborhood," resident Ruth Scully said. "These are veterans...we go by this every single day on our walk." 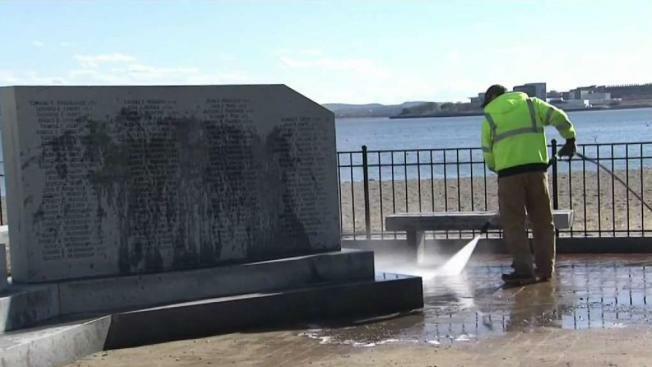 Locals, along with crews from the Department of Conservation and Recreation and the Massachusetts Port Authority, spent hours power washing and using Dawn soap in an attempt to clean up the memorial. “It’s like kicking gravestones over,” said local resident John Maddox, who tried using baking soda to remove the oil. The memorial, which has more than 200 names listed and is located at the beginning of the causeway heading out to Castle Island, has been around for about 15 years and honors veterans from Southie and Dorchester who made the ultimate sacrifice. “This is a generation that put on a uniform and went overseas to fight Nazi Germany, to fight for our way of life, and to have their memory desecrated this way is unacceptable,” said State Representative David Biele. “I would just like to find the idiot that did it and make them come down and clean it with a toothbrush,” Scully said. Experts will be at the site Tuesday morning to take a close look at the memorial and see what can be done to restore it and get rid of all the oil. The exact time of the vandalism remains part of the ongoing investigation. Anyone with information is urged to call state police at 617-740-7710. Meanwhile, the VFW Post in South Boston says the creator of the memorial died Monday night. Post 561 announced the news on Twitter, saying John Mullen would be dearly missed. "The patriarch of our post for so many years, John Mullen, passed away tonight," the tweet read. "His contributions to our community were profound, including creating a South Boston WWII Memorial.. a war in which he bravely fought in the Pacific. We will miss him dearly. The post Vandalism at the WWII Memorial appeared first on Caught In Southie.